Rugby League - Ovenden v Illingworth. Dean Robertshaw for Ovenden. Ovenden won 34-10 against Upton at Pontefract on Saturday in a bad tempered Pennine Presidents Cup first round tie. Five yellow cards were issued, plus a red for Ovenden back rower Nick Cassell after retaliating in the tackle, and that did not help the flow of the game. 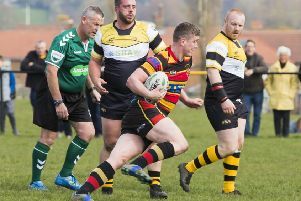 However, it was the visitors who kept their heads and went through with tries from skipper Shaun Smith, Dean Robertshaw, Callum Pilling, Graham Charlesworth and a brace from Jason Dodd. Chris Holroyd tagged on four conversions with Robertshaw picking up the man of the match award, closely followed by Holroyd and Dodd. Ovenden are in National Cup action next weekend and for the second round running face Conference opposition. Having knocked out holders Hunslet Old Boys, they now face East Leeds at Four Fields. They will want to remain unbeaten in the continued absence of coach Jake Connor, who is away with Hull in Australia. BARLA National Cup, round two: Queensbury 0 Haydock 22. Pennine Presidents Cup, round one: Upton 10 Ovenden 34, Ossett Trinity v Queens P, Sharlston Rovers 18 Illingworth 0 (walkover). Pennine Andrew Bennett Memorial Trophy, round one: Underbank Rangers 18 Ovenden A 0 (walkover), Moldgreen 18 Woodhouse Warriors 8, Wyke 30 Moorends Thorne 28. Pennine Supplementary Cup, round one: Cowling Harlequins v Wortley Dragons P, Kippax Welfare 18 Upton A 0 (walkover), King Cross Park 42 Wakefield City 4. Division Two West: Hollinwood 10 Hanging Heaton 54, West Craven Warriors v Greetland All Rounders P.
Division Two Central: Clayton 18 Oulton Raiders 16. Division Two East: Allerton Bywater 10 Doncaster Toll Bar 18, Methley Warriors 48 Kinsley Hotel Raiders 0. Bradford ARL Jack Senior Memorial Trophy, round one: Wibsey Warriors 18 Birkenshaw Blue Dogs 0 (walkover). Xamax BARLA National Cup, round two: West Hull v Sharlston Rovers. Round three: Ovenden v East Leeds. Bradford ARL Jack Senior Memorial Trophy, round one: Odsal Sedbergh v Queensbury. Castleford & Featherstone ARL David Poulter Open Cup, round one: Sherburn Bears v Methley Warriors, Cutsyke Raiders v Featherstone Lions, Allerton Bywater v Kippax Welfare, Brotherton Bulldogs v Lock Lane. Halifax ARL Challenge Cup, round one: Siddal v Ovenden A.
Wakefield ARL Chairmans Cup, round one: Kinsley Hotel Raiders v Upton A.
Pennine ARL Andrew Bennett Memorial Trophy, round one: Oulton Raiders v Doncaster Toll Bar, Eastmoor Dragons v Clayton. Pennine League Championship: Queens v Ossett Trinity. Division Two West: King Cross Park v Moldgreen, Underbank Rangers v Greetland All Rounders, West Craven Warriors v Hanging Heaton, Hollinwood v Cowling Harlequins. Division Two Central: Birkenshaw Blue Dogs v Woodhouse Warriors, Wyke v Wortley Dragons.